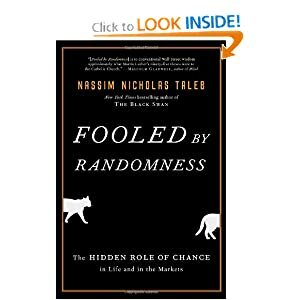 About halfway through a great book, Fooled by Randomness – The Hidden Role of Chance in the Markets and Life. by Nassim Nicholas Taleb. He makes the interesting point that if your success is from a random event or ‘luck,’ then you are vulnerable to losing it by a random event. He then goes on to show how most things are indeed random and ‘lucky’ with considerable justification. Which includes most business people, and most of Wall Street. But then of course, everyone, including myself, have a puerile instinct to believe that we are special, and our decisions of course are brilliant and the real reason for our success. Things that aren’t the result of luck are something like a dentist – they have learned a trade, have educated themselves in a skill, which can’t be learned by reading a book. One of the examples he gives is 10,000 investment managers. Each has a 50% chance of making $10,000 and 50% chance a $10,000 loss. At the end of each year, all the managers who lost money are fired. After the first year, 5000 are fired, and so on each year, 2500 the next, 1250 the next, 625 and then 312 after 5 years. Surprisingly, just with a 50/50 chance over 300 investment managers have a ‘track record’ of making money for 5 years. The kicker is that year number 6 is no different to any other year – the remaining 312 still only have a 50% chance of making money – their ‘track record’ is of no consequence. Further, given a hugely elevated random element and longer time frame, one of the fundamental assumptions of success requires a second look, namely that asset values will continue to increase in the future at the same rate as they have in the past, (oh, ask Lehman Brothers or Merril Lynch) which seems increasingly dubious. All in all a fascinating read! And I will have to revise my earlier post regarding the 10,000 hour rule be be really successful.